Designing a VR training experience for retail. Virtual Reality Project — Study Case. 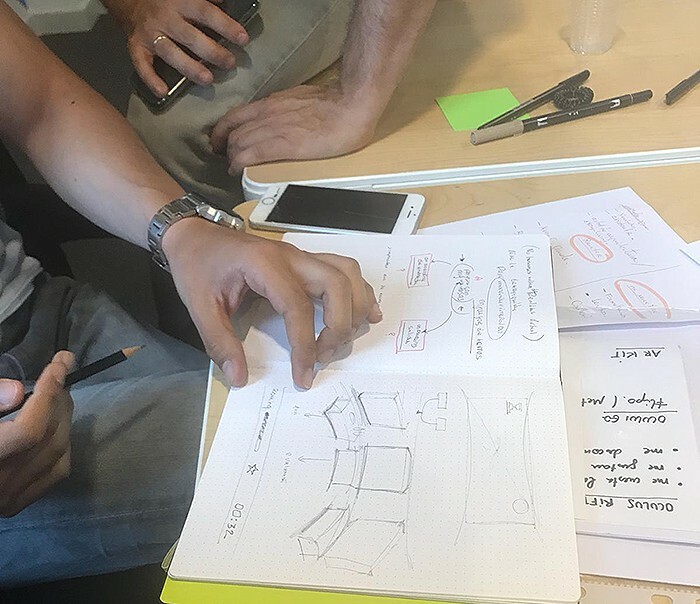 GROU·VR is a project from a hardworker team developed at the UXER SCHOOL in the Virtual Reality Design Immersive course. The VR and Retail training. Retail is one of the markets that is making a big bet in Virtual Reality, either driven to support the final consumer or training the employees of the business itself. Our main objective was to find an experience that could enhance the knowledge to the customer support and the know-how of the mall/store/ supermarket by the staff. We structured and focused our exploration and research on the following “market area” or “niche”: Retail on Clothing Stores. 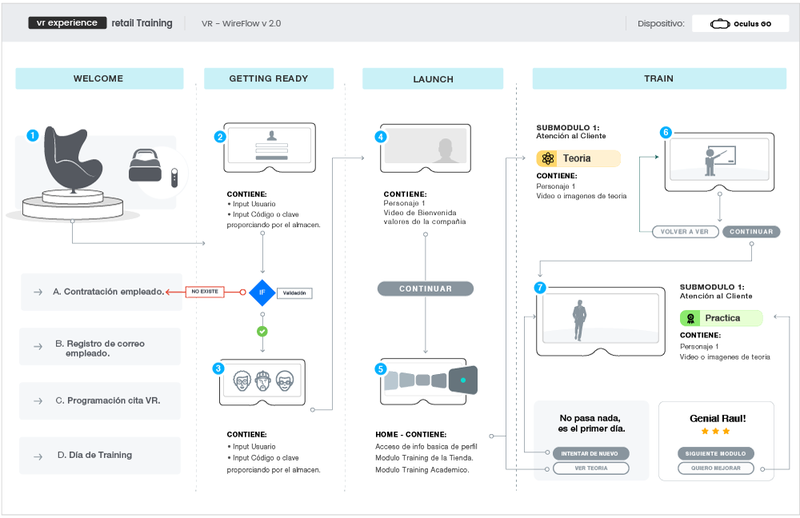 The Design process in Virtual Reality differs from any other design process only in some steps that are specifically and strategically placed in order to articulate the needs of an immersive experience. For example, the Narrative(green box) or so-called Story-telling of the experience is actually one the most important phases or parts. Any lack of Narrative at a Virtual Reality Experience may cause less sense of immersion. 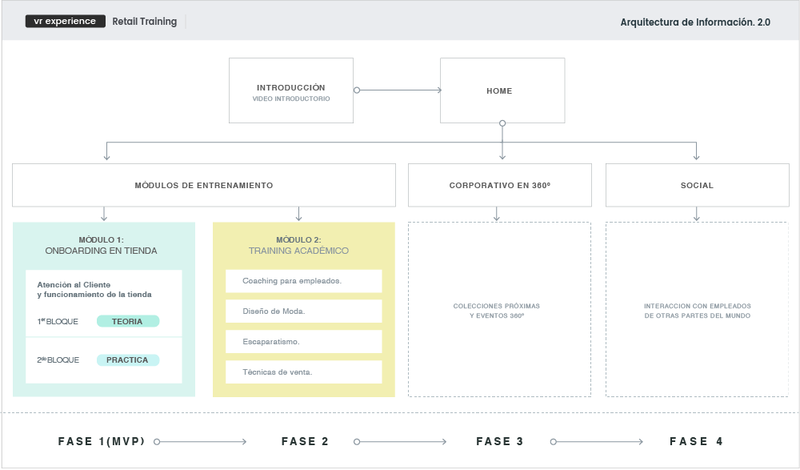 My Role on the Project (Juanfer Murcia): I worked collaboratively on the Research, UX Thinking and Visual Design. 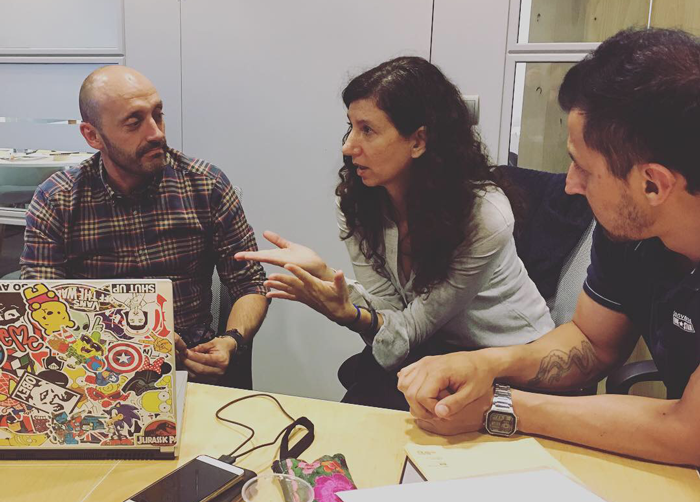 My Team: Gema Gutiérrez (Interaction Design), Cristina Mur (Design Concept) and Carlos Ocaña (Unity Prototyping). Group discussion about giving value. First, we came up with a preliminary hypothesis around how we could give and add value to the employees from a typical Clothe Store (no matter the size of it) with the Virtual Reality technology. Now that we had something to start with, we went to make some guerrilla interviews and exploratory visits to different stores around Madrid, Spain. (H&M, Zara, Primark). Left: Gema and me doing “guerrilla” interviews. 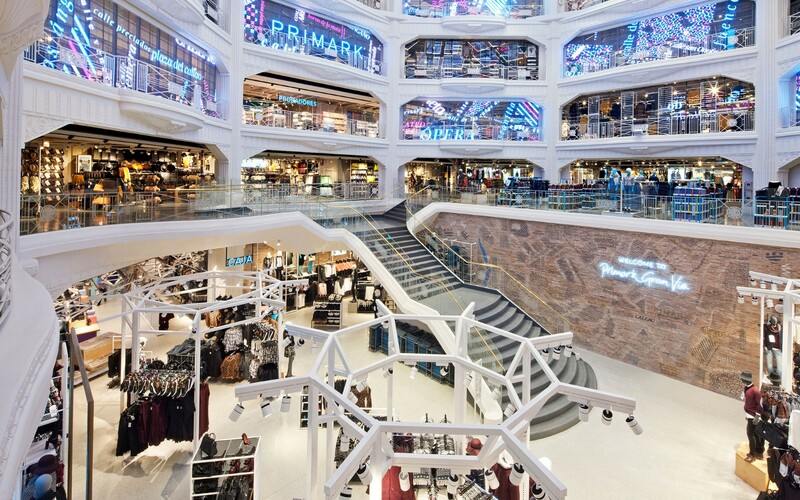 Right: Some picture took from the inside at Primark store. What we found was kinda disconcerting but somehow very interesting; most of the clothing stores we visited and the employees we interviewed gave us a totally new perspective. The pattern we found when asking the employees (clothe sections driven) about the type of training they received at the store in the past and how they will feel to do a training program to sell more was pretty shocking!! 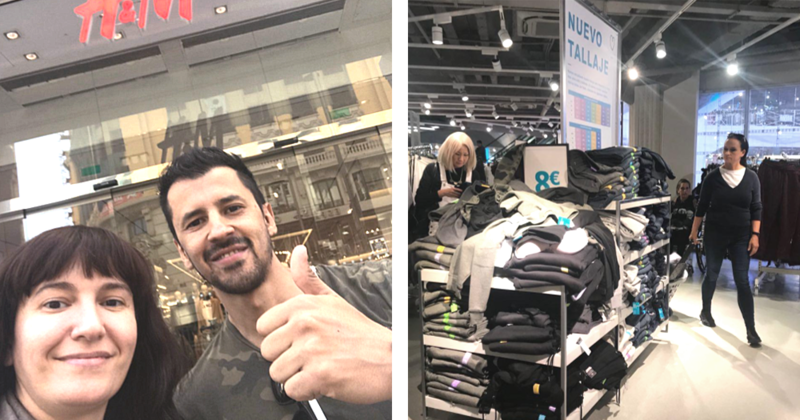 Primark Cloth Store, Biggest store in Madrid Spain. We failed in our first hypothesis (why? see the next point). Clothing stores like H&M, Zara, Primark sells without the need of persuasion from the employee, never the less occasionally the employees can serve and support the customer when they ask for help. When speaking about massive selling clothe stores the main labors of the employees from cloth sections are basically: a). Clothes re-organization, b). Recollecting clothes from the dressing rooms and c). Found specific sizes and guide the customer in a fast and punctual manner. No need to train the employee to sell more was ever asked by the employees. Fortunately, we discovered this soon and we needed more information to clarify all these points and hopefully get to a conclusive solution. That's when we started to do some basic Desk Research and a few Online surveys. 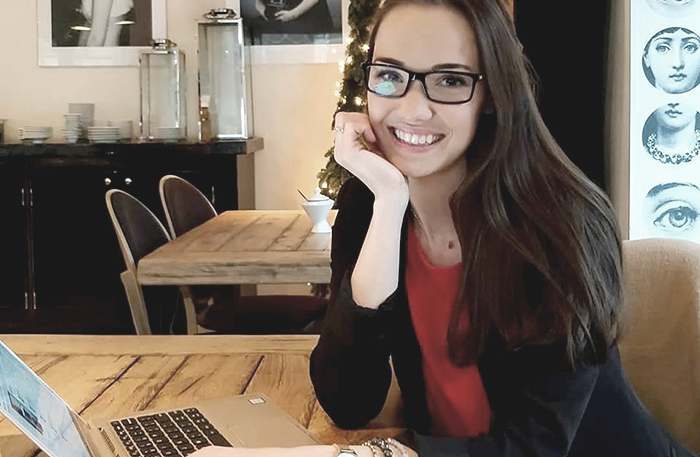 We research a little further over the internet about retail in fashion, employee tasks in clothing store companies, clothing store employee reviews and training in retail. 50% of product managers from Inditex comes from their own stores. For those who don't know Inditex is the Spanish company that owns all of these stores Zara, Pull&Bear, Massimo Dutti, Bershka, Stradivarius, Oysho, Zara Home and Uterqüe. It’s a good job to develop customer service skills. You can learn a lot although selling the merchandise is just a tiny part of the job. The analysis focused on the survey results. The respondents (about the 39% useless training) argued their negative to useful training under the following question. (See below). What would you like to learn in the training that was missing? More about customer service.- Employee. Actually everything, and not to defend yourself with customers without the needed experience. - Employee. More about dealing with clients and clothing materials.- Employee. There’s a clear opportunity to involve VR academic formation in the training to retain talent and to let the employees develop their professional skills. In big clothing stores, there's a clear lack of training satisfaction results due to the absence of reality in the training facing situations with real customers. Clothing retail has a big impact on the relationship with the customer, and selling clothes on big stores is a tiny part of the process. 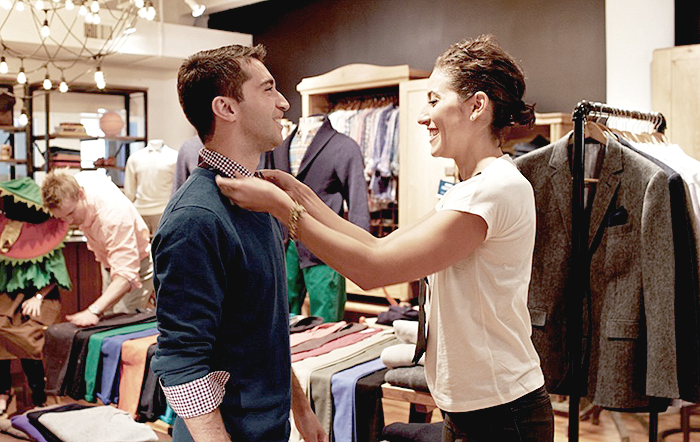 Employees in big clothing stores don’t have the appropriate onboarding training mostly because it lacks on knowledge for facing the real day to day customer/store situations. 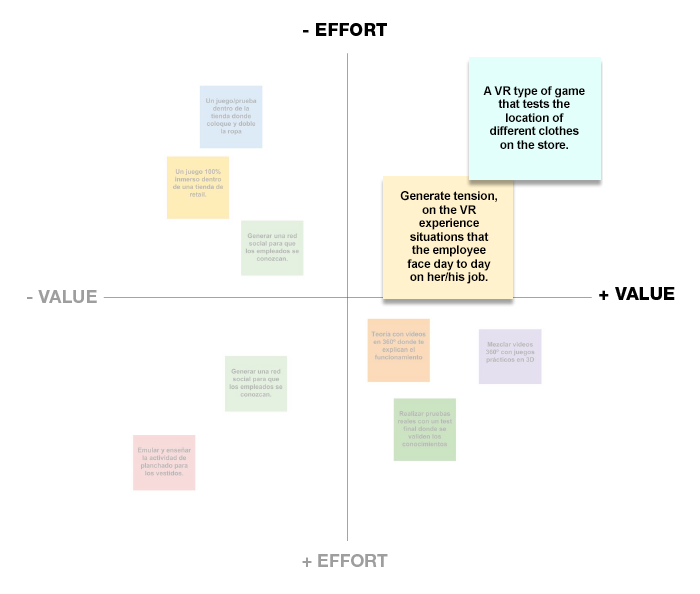 Using axis-quadrants to prioritize the MVP. Finally, we came up with two different ideas. (See graphic above). But we decided to make them co-exist in only one(See solution below). 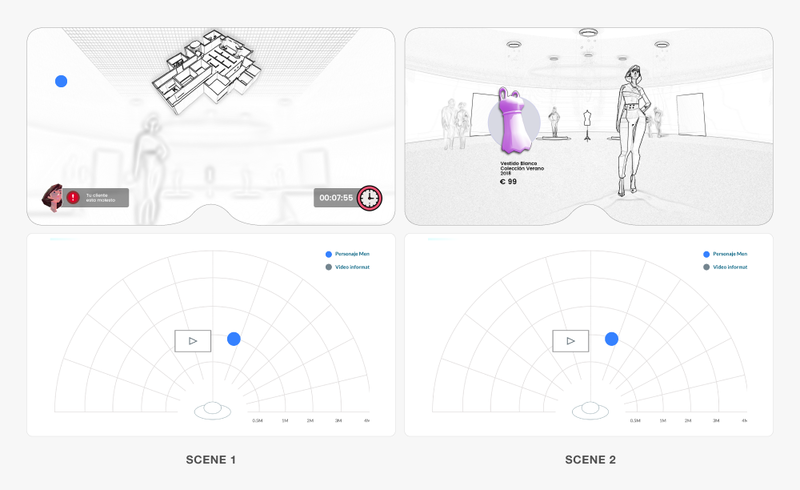 A ‘learning by doing’ Virtual Reality application (Game Type), that immersively emulates the situations of tension that the employee face in his/her real life day to day job activities. It allows the employee to experience the practice immersively, facing the real facts of their own day to day jobs (noize, rush hours, traffic of people, different customer personalities, etc). It let us optimize the time. It accelerates the time invested in the old training due to immersions of only 10 to 20-minutes duration. It’s measurable and we can learn from it. By the use of Virtual Reality technology, we will be able to analyze the behavior from the employee at the act and making them learn about their decisions or mistakes before confronting these situations in real life. 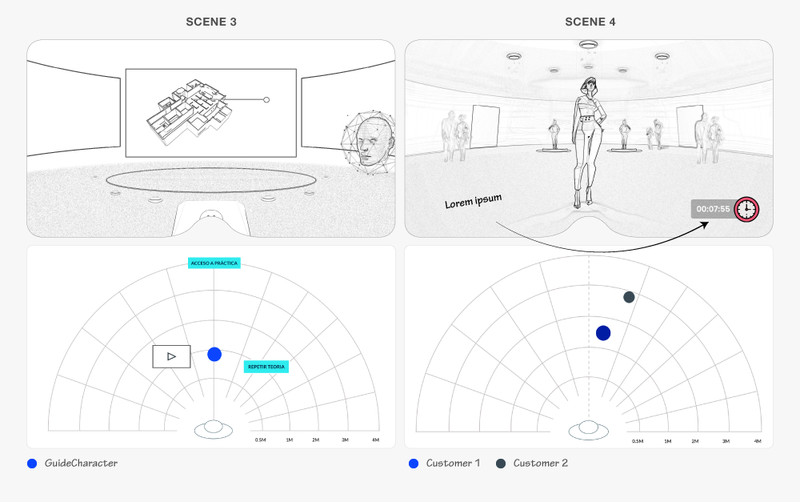 In order to lead the employees to their real situations of tension, we found an opportunity building customers as characters from their day to day and make the accurate narrative path that could end in an immersive training so the employees could face and learn from it. (See the image below). In the above example, we use a customer as an antagonist; this one recreates a profile of a nervous woman been on a rush for buying some clothes while using the dresser lots of times and trying clothes from different sections of the store. Function: Welcoming the user and introduce him/her to the company as well to onboard him/her to the training course functioning. Interaction: Only informs and doesn't interact in any other way during the experience. Function: To help the VR user during the practices. Interaction: User will be able to access the AI through voice commands. Function: Understand the store brand, theories, store functioning and pass the practice tests. Interaction: During the theory is a non-impact character, but during practice is the opposite. Function: To put the VR user(Employee) in a risk situation by setting challenges like finding Clothes in different sections of the store under timing mode, due to the rush of the customer. These activities may vary depending on the customer type, also the customer varies depending on the Module training; but for MVP purposes we started with only one customer type. 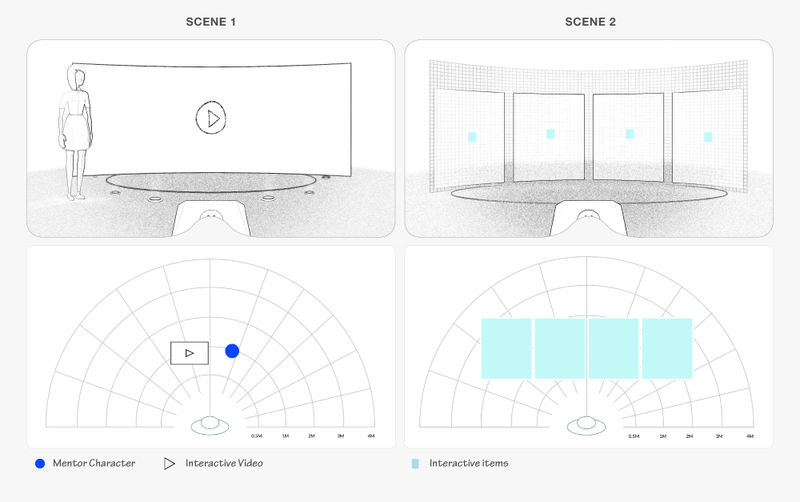 Interaction: Communicate with the VR user by making a series of requests. 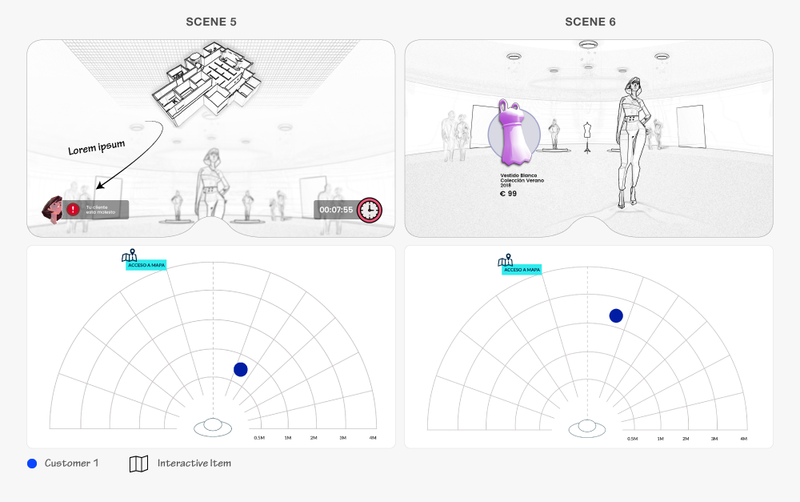 For our VR application experience, we defined only 2 levels of navigation but we ensure to give the user training modules not only for learning the function of the clothing store (Green Box, See image below) but also modules of academic training (Yellow Box, See image below) so they could perform and feel the professional development of their hard skills, something that was actually pretty obvious in the research. On the other side thinking on the future of the business as well the planning of it we considered the Phase 1 (MVP, Green one — see image below) will be the more added value phase to the business and store, therefore Phases 2, 3 and 4. 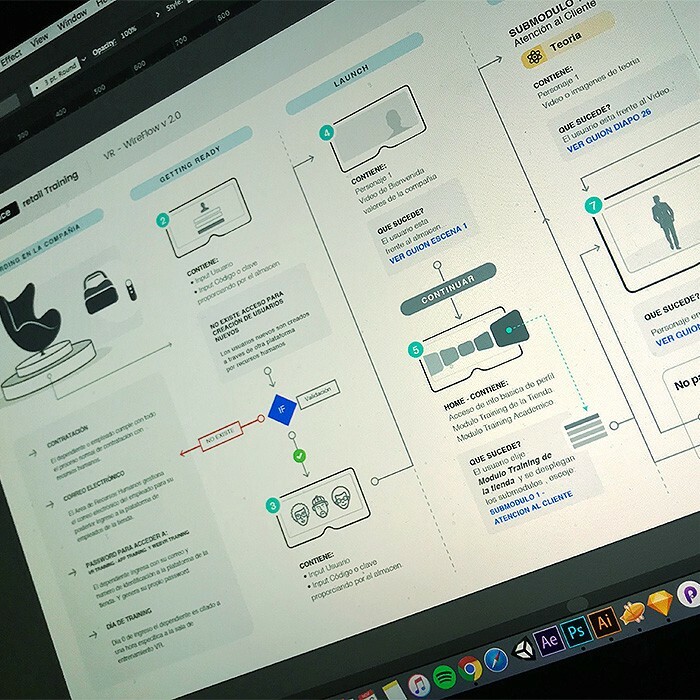 Our User flow helped us to identify the possible “ins and outs” from the user even before the immersion since one of our concerns was: where exactly was this going to happen (the VR immersion) in the real world? and how does the store had to lead the employee from the hiring until the training immersion? We had all set and ready for the fun part!!!. 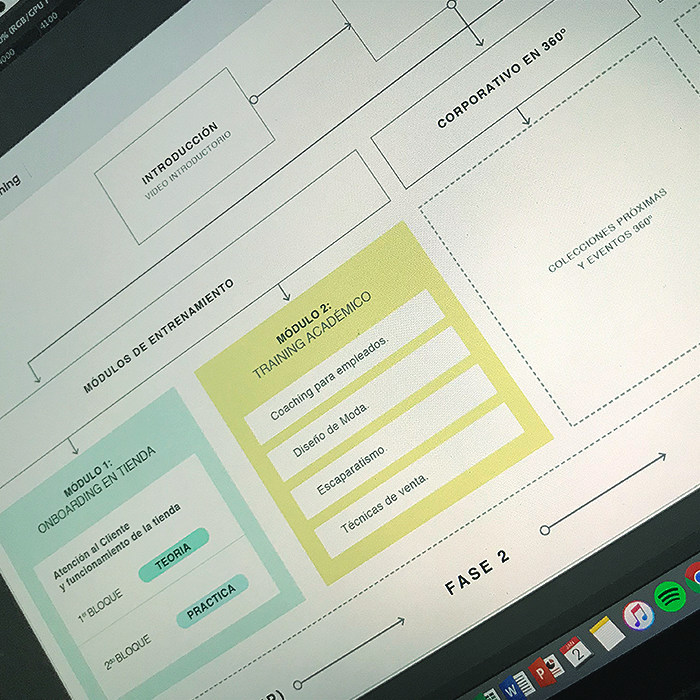 The sketching process was good for us to imagine and be creative on how the user scenarios and some of the UI ’s could be. 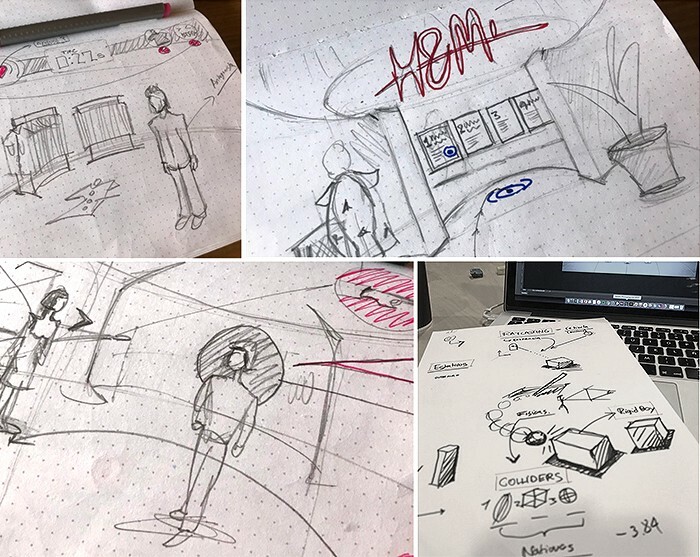 While we had almost everything set and the sketching was a good help to establish some foundations; the design concept was still missing. How this will had to look like? Which color(s) we were going to use? What kind of vibe or mood does the employee will have to feel meanwhile training? …Could be fun at the end? , or maybe we had to stick to some serious look by a company? Those were some of the questions we realize we didn't cover in the previous process so far. This is when we decided to start digging with our first mood board approach. Our Design concept for the VR Training in retail. Since playing can foster effective communication this was definitely a good manner to not only make the employee feel in a different mood but to be sure the user will learn in a more efficient way. 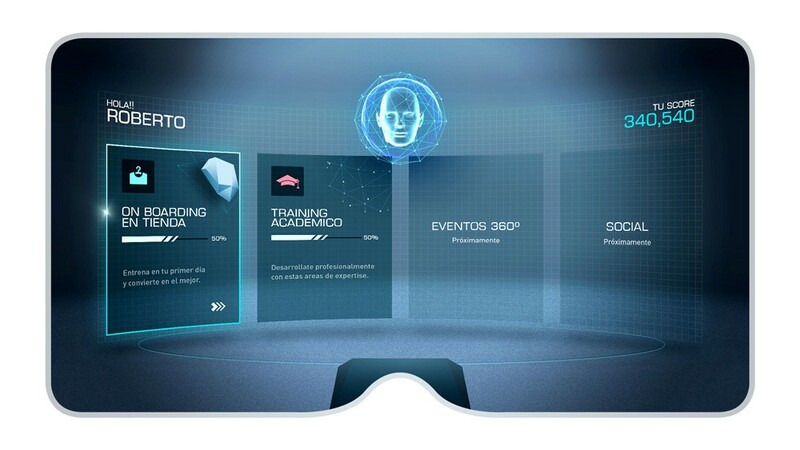 Since doing Virtual Reality could be a high-cost performance for some devices we found very useful to apply the Low Polymeter 3D types to our experience attached and linked to the video game futuristic principles. 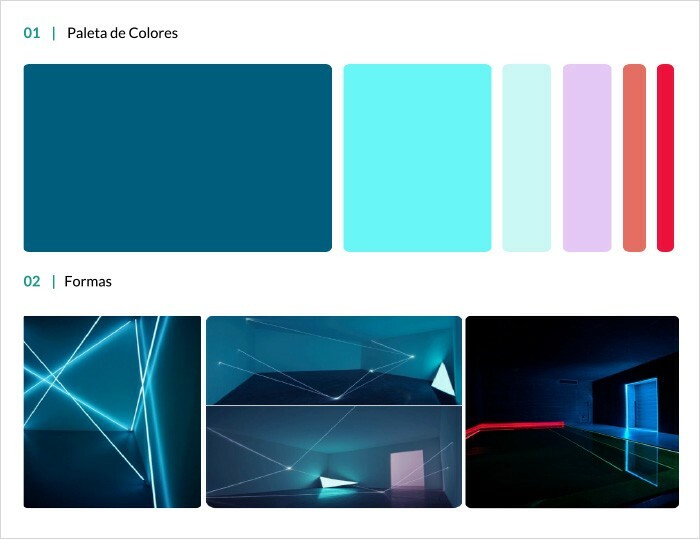 We also made some moodboarding process to find some possible concept art for the scenarios considering all of the above. 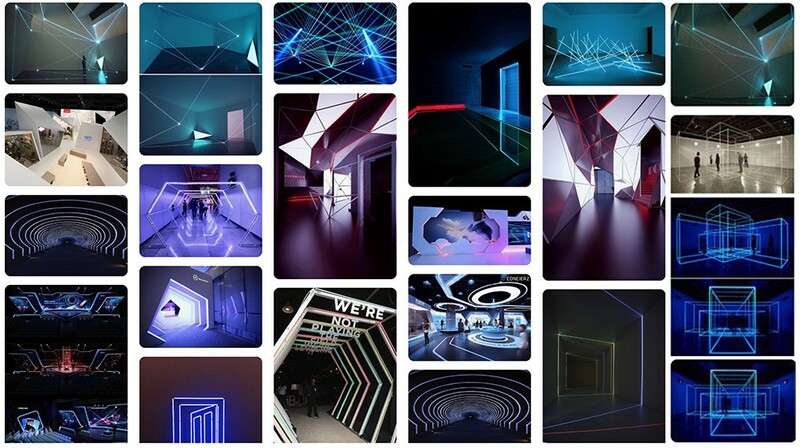 This text will be about the first step of approach to the design concept of the VR experience…. 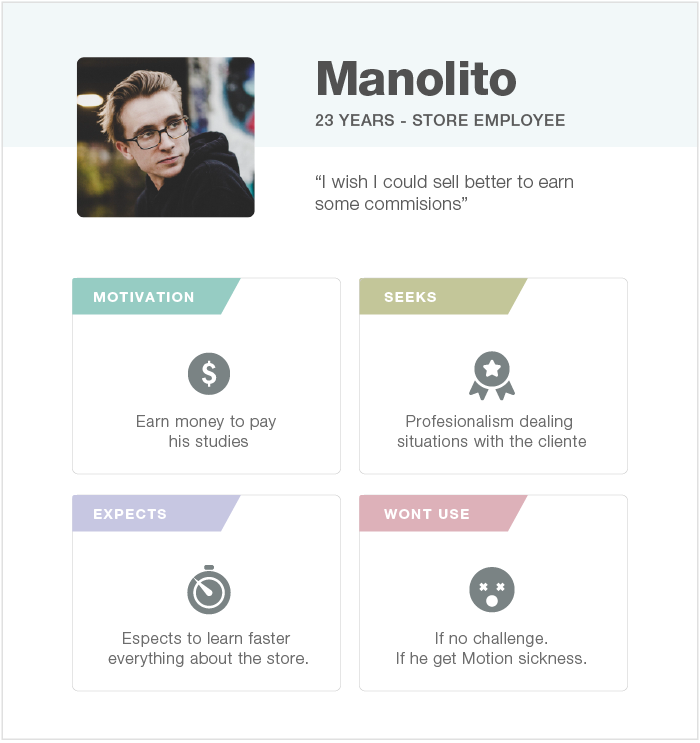 In the above example, we use a customer as an antagonist; this one recreates the typical profile of a woman using the dresser lots of times and trying clothes from different sections of the “big clothing store” while asking different support questions to the employee. Scene 1 / Introduction: The only possible interaction here is the Closing X at the front panel. Scene 2 / Home Menu: User could select with the gaze pointer an option from the menu. Scene 3 / Theory: Terminada la teoria podrá escuchar de nuevo el audio haciendo clic en el icono “Repetir”. Acceder a la práctica haciendo clic en la puerta situada detrás del guía. Scene 4 /Practice Greeting: Saludar a los clientes dejando el punto fijo del mando durante al menos 3 segundos sobre los clientes, activándose así el countdown. Scene 5 / Practice Store distribution: Mirando hacia arriba el usuario podrá acceder al mapa de la tienda. Una vez abierto este podrá seleccionar la zona de la tienda donde se encuentre la prenda para teletransportarse a ella. Scene 6 / Practice Dresser room: we use a customer as an antagonist; this one recreates the typical profile of a woman using the dresser lots of times and trying clothes from different sections of the “big clothing store” while asking different support questions to the employee. Scene 5 / Introduction: we use a customer as an antagonist; this one recreates the typical profile of a woman using the dresser lots of times and trying clothes from different sections of the “big clothing store” while asking different support questions to the employee. Scene 6 / Home Menu: we use a customer as an antagonist; this one recreates the typical profile of a woman using the dresser lots of times and trying clothes from different sections of the “big clothing store” while asking different support questions to the employee. 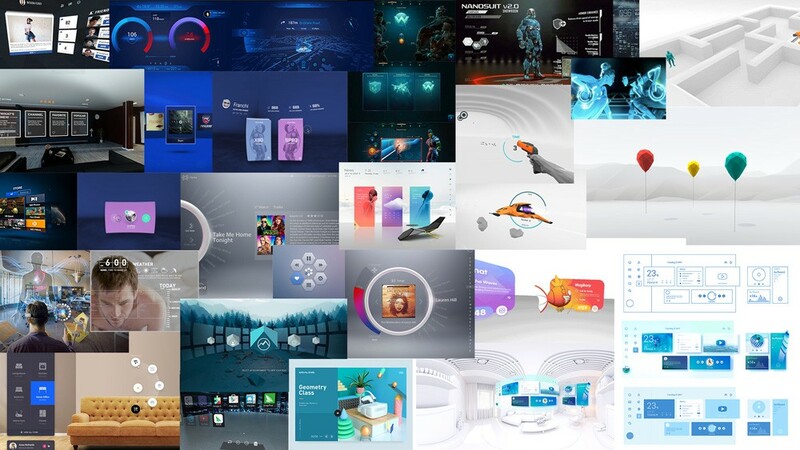 This text will be about the Home UI interaction and why….